In this blog I want to give you a deeper understanding of Dynamic Data (also called Dynamic Content - though that's not the same thing). It' a level 300 briefing so it's meant more for more experienced users. A "Person" content-type might contain first-name, last-name, birthday, etc. A "Product" content-type might contain a product number, price, etc. A "ImageMetadata" content-type might contain the file itself, a title, created-date etc. A system component like a view / template must also be defined, with information like name, template-file etc. Let's call this content-type "TemplateDefinition"
The AmountOfKids of a person may need some configuration just for the number like minumum 0, maximum 64 (world record) - which should not be in a @All content-type. So let's say this is stored in a content-type "@Number"
And the pipeline-configuration for the query "Get all references of the category in URL" must also be stored in a (actually various) content-types. Let's call that "PipelineConfiguration"
This all seems straight forward and like basic database table design with a bit of "Dynamic" added. But if the normal user would see all the 50+ content-types needed for a full system to work, it would get very, very confusing. So it would scare the users, and very likely the user would change something (like the definition for @All) which she should never ever touch. This is why we introduced Scopes in 2sxc from the very beginning - and we kept them secret because we figured people don't need to understand this. But just recently I discussed sharing content-types (another topic for another blog) with Benoit and realized that keeping this a secret will prevent people from fully using 2sxc - so in 2sxc 8 we're coming out :). Technically it's just a text-value which each content-type has. 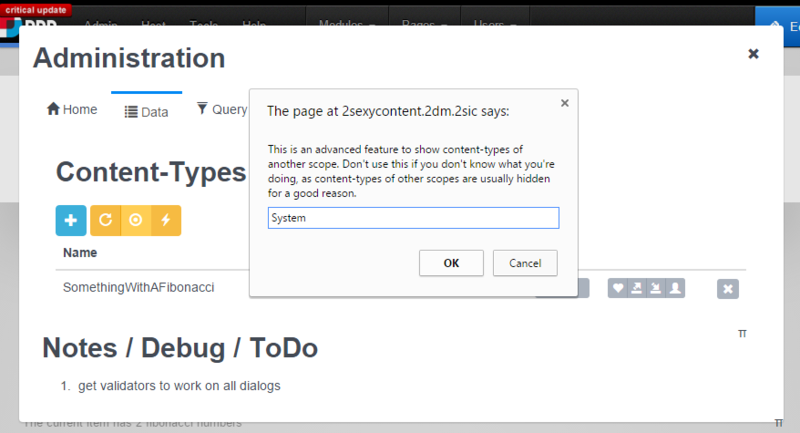 Since the UI always retrieves content-types of a specific scope ("2SexyContent" by default), the user will never see the other content-types. Internally it also has a few affects - so the UI will always look for attribute-definitions in the System-scope. SexyContent - containing everything you usually see - so the "SimpleContent" or things like that are found here. This is the default scope. 2sic 8 has a new advanced mode in the admin-area which you can get by Ctrl-Clicking anywhere. The round button is for changing scopes - type the desired scope name and see what comes. Most content-types will tell you they exist (like @String) and that there are many entities of this type which you can also edit. You'll also notice that most content-types cannot be reconfigured. This is because they are Ghost-Content-Types which are shared from a central definition (yes, another secret functionality I'll blog about soon). They exist here merely as an anchor for storing content-items, but the definition cannot be changed inside your app. 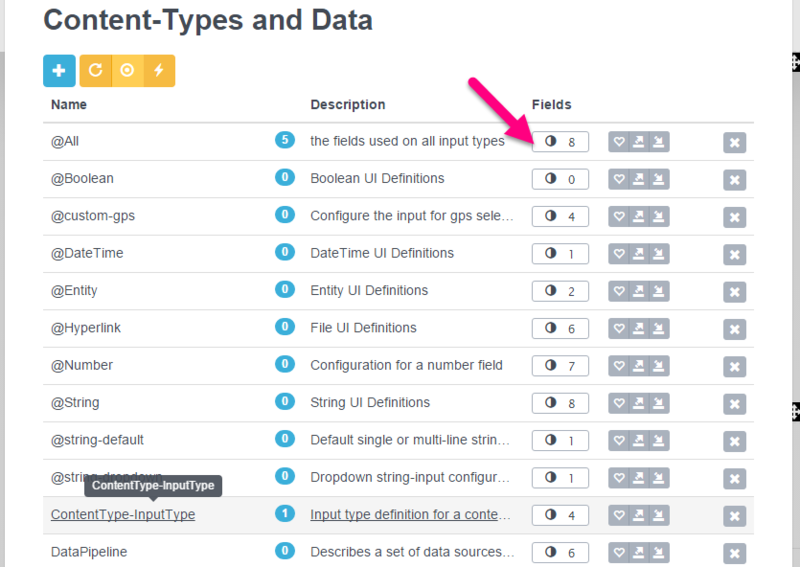 You can recognize Ghost-Content-Types by the special icon and the fact that you cannot edit the field-definitions. Note that most of the data here is metadata for something. 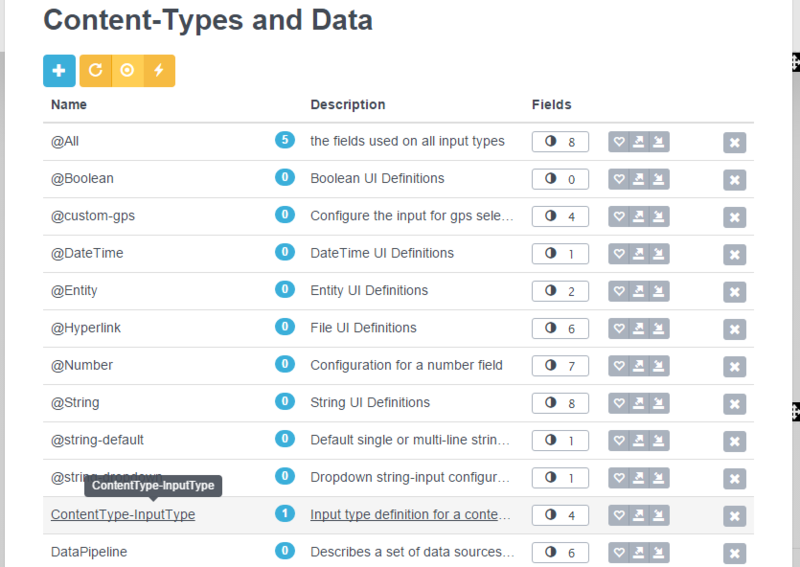 So looking at items of @String or even editing it can have funny effects, because each item of the type @String is used to configure the input of a string-type. Metadata-items can be recognized by the tag-icon beside it. You can see what object is being enhanced by hovering over the tag. And yes - Metadata is another one of the secret features I'll have to blog about sometime :). So I hope this gives you a deeper understanding of the data-structures and possibilities in the EAV / 2sxc. I promise to blog about metadata, shared and ghost content-types as well as creating custom input fields soon.